The Dülmen Ponies are living in a sanctuary which is placed in the Nature reserve of the Merfelder Bruch (12km west of Dülmen, Munster land). Obviously they are the last real wild horses in whole Europe! 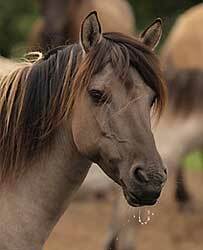 … is one of the oldest horse types and was first mentioned in 1316. At those times the wild horses still had a wide and big habitat of plenty of acres. But they could not escape the industrial developments: people began to extend the cities what caused a diminished habitat of the wild horses. The Dülmen Ponies stood in their original habitat what today is called the „Merfelder Bruch“ and can be found in the west of Germany. The members of the original wild horses diminished to a dangerous number: in only a short period of time they became an endangered species. They were rescued by Duke Alfred von Croy. In 1847 he decided to save the life of the last horses and built a wild horse sanctuary on his large land holdings. Since that year the Wild Horse Sanctuary had to enlarge several times, caused by an increasing number of the wild horse members. 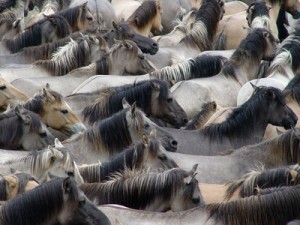 Today the herd of the wild horses has about 300 members. How do the Dülmen Ponies live? Today the Wild Horse Sanctuary has a size of about 350 hectare so that it offers a big habitat for 300 horses. The landscape of the sanctuary has woods as well as meadows and grassland. The animals live in their family clan and manage their life totally on their own what means without any human help. Neither a blacksmith nor a vet has ever visited the wild horses. According to this weak and sick animals died what caused a natural selection. Only tough horses survived the hard conditions of natural life and only these tough horses passed their genes. Consequently today the Dülmen Wild Horses are horses of a really tough species who are totally able to live on their own in the wild nature. In times of strong rain or an intense solar radiation the animals do have a refuge underneath the treetops. Generally human influence is not provided. Only in extremely cold and long winter periods the horses get external hay or silage. 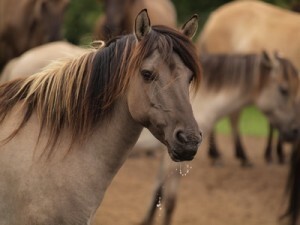 Visitors are invited to explore the life of the wild horses. All around the sanctuary you can find plenty of hiking trails from which you can often watch the horses in their natural way of life – totally fascinating! The Dülmen Ponies live in a totally safe sanctuary what means that they do not have any natural enemies like bears or wolfs. They have a natural reproduction increasing the number of the herd members. Naturally after a certain time this causes a problem because the habitat is not able to offer enough space for more than 300 horses. Stallions who are older than one year want to found their own herd. Due to this they have struggles with other young stallions causing dangerous and risky situations. In 1907 people found a solution for this problem and established the annual wild horse trapping. Since that year this event became a real tradition what takes place on every last Saturday in May. Visitors can see how the whole herd gets trapped into an arena. The young stallions get separated from their herd and then caught by some courageous men – and these men do not use anything else but their hands! Very impressive! After the great and exciting event there is a public auction where one can buy a young Dülmen Pony. Certainly the young stallions lose their liberty and independence. Nevertheless one has to think about the safety oft he whole herd what makes the auction more comprehendible and moral passable. Because of their rough and calm characteristics Dülmen Ponies are often used as horses for children or carriages. Why do we still need wild horses? Wild horses all over the world are not only symbols of independence and liberty but also very useful for our prospective horse breeding. Today’s breeding is orientated on specific characteristics. Our domestic horses were bred for their respective use: some horses are very fast, some have long legs and are quite spirited, others are small, docile and tough. After a certain period of time this breeding leads to horses who offer so many special genes that they also have an absence of other important ones. The absent and lost genes are genes for the natural characteristics like natural instincts or even a tough health. Considering this, there are no good expectations for the further development of our horses. Experts found a solution for this great problem: the wild horses. These species still has natural characteristics and genes which make them tough and healthy. If we interbreed the wild horses with our domestic horses important genes become reimported. This creates horses that have more characteristics of their origin than of a circus clown – and this does not only offer advantages for the horses but also for us horse owners! “The Dülmen Ponies are living in a sanctuary which is placed in the Nature reserve of the Merfelder Bruch (12km west of Dülmen, Munster land). Obviously they are the last real wild horses in whole Europe!” WHAT, WHAT, WHAT ??? What is the difference between a real wild one and semi-wild one? A certain century, the origin >< the place they live? Something else? Horses LIVING wild ARE NOT necessarily wild, is that what you are saying about camargue horses and konik polskis, for example? "The Konik (Polish: konik polski) or Polish primitive horse is a small horse, a kind of semi-wild pony, originating in Poland." "In Maastricht, the Netherlands, a herd was released in 1995, in 'de Kleine Weerd', a 12 hectare strip of land (roughly 100 m by 1 km) along the river Meuse. The area is open to the public, but people are advised not to go near the horses because their reaction is unpredictable. Koniks have also been introduced in Latvia and the United Kingdom because of the success of such programs. Koniks have been introduced into Wicken Fen near Cambridge by the National Trust. Koniks have also been introduced to a number of Nature Reserves in Kent, England by Wildwood Trust (the charity which runs the Wildwood Discovery Park) and Kent Wildlife Trust. These include Stodmarsh National Nature Reserve, Ham Fen National Nature Reserve, Whitehall Meadow, Sandwich Bay and Park Gate Down." "Breeding centres Nature reserves: Popielno, Roztocze National Park, Stobnica Research Station of the University of Life Sciences in Poznań". "The Camargue is an ancient breed of horses found in the Camargue area in southern France. For centuries, possibly thousands of years, these small horses have lived wild in the harsh environment of the Camargue marshes and wetlands of the Rhone delta. There they developed the stamina, hardiness and agility for which they are known today. " Love animals… Would love to see more… Horses are absolutely beautiful… Thank you… Eugenia from Northern California…..